As rail tours go, Jewels of Persia is truly amazing. Travelling from the ancient land of Persia to the shores of the Bosphorus and onto the banks of the Danube, this unique journey takes in destinations that are rarely experienced by the Western visitor, which makes it all the more special. Arrivals day in Tehran where you will be met and transferred to the five-star Espinas International Hotel (or similar). We will enjoy a welcome reception dinner, whilst you meet your fellow travellers on this highly anticipated journey. Our first port of call on our city tour of Tehran is the Crown Jewels Museum in the Central Bank of Iran Building, with its vast array of crown jewels used by the Qajar and Pahlavid royalty. Following lunch we head to the Gulestan Palace with its renovated Versailles-inspired mirror-encrusted Marble Throne Hall used for the coronation of the last Shah. 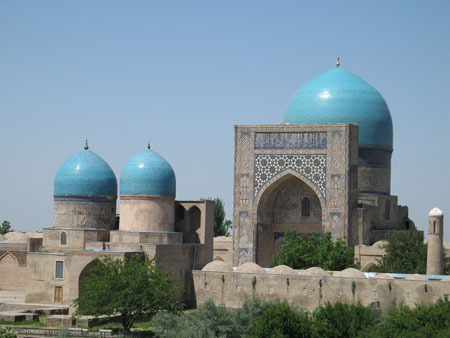 Most of the remaining brick and tile buildings date back to the 19th century Qajar dynasty. Late afternoon we transfer to the main railway station in the city and board the Danube Express. Settle in to your cabin and later enjoy dinner as the train heads overnight to Mashhad. An early morning arrival provides us with the whole day to explore the city of Mashhad, which is home to the Imam Reza Holy Shrine, the largest mosque in the world in terms of its dimension, followed by a tour of the Nader Shah Museum. Following lunch in the city, we will visit the Tomb of Ferdowsi, the father of the Persian Language who lived over 1,000 years ago. 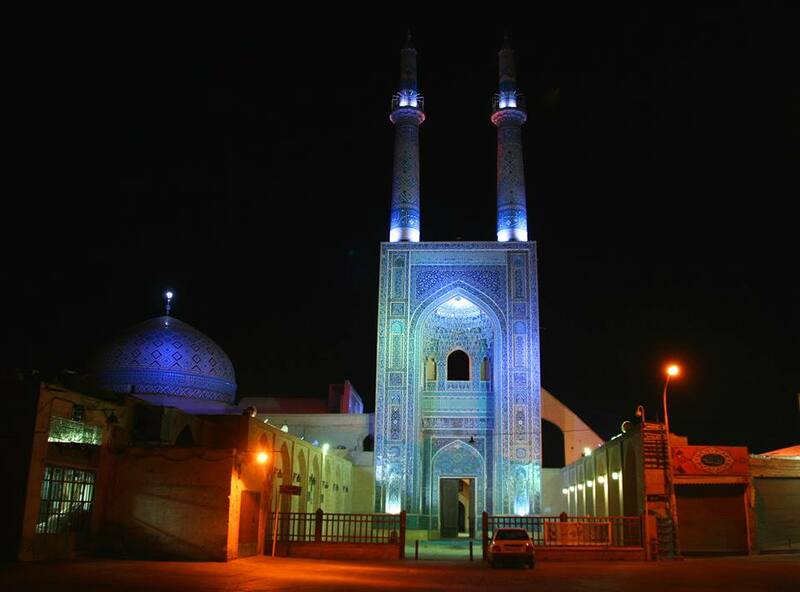 Today we will travel from Kerman to the city of Mahan to visit the famous 19th century Prince Garden as well as the 15th century Mausoleum of the Shah Nematollah Vali, the renowned Iranian mystic, poet and philosopher who died in 1431. Lunch is taken in the very impressive restaurant situated inside the Prince Garden before we return to Kerman in the afternoon with a visit to the Green Dome and the Sanati Contemporay Museum. The city is famous for its silver filigree and metal work, array of great historical monuments, and its Life-Giving River, the Zayandeh-Rood, which has given the city its beauty. Isfahan is packed with some of Iran’s best sights and today we spend a whole day in the city, visiting the Chehel Sotoon Palace and the Vank Church in the Armenian Quarter. Following a traditional Iranian lunch we move on to Naghshe Jahan Square, a World Heritage Site and the second largest man-made square in the world, where the Ali Qapou Palace and Shah and Sheikh Lutfullah Mosques can be found. Here, the time is yours to enjoy the huge square and pick up a bargain at the handicraft Bazaar of Qaisarieh. The UNESCO World Heritage Site of Sultanieh is our first stop upon arrival in Zanjan, with its 13th century mausoleum of Oljeitu, the Il Khanid sultan. A visit to the old Rakhkt Shoor Khaneh and the Museum of the Mummified Salt Men concludes the day. In the early hours of the morning we cross the border from Iran into Turkey to Van where we will navigate the old streets of the town and marvel at the beautiful silver and hanging kilims (woven carpets) made from natural dyes. After lunch a six-hour crossing by train ferry takes us from Van to Tatvan, where we briefly stop on Akdamar Island to walk to the stunning Akdamar Kilisesa or Church of the Holy Cross. The walls are adorned with Old Testament carvings telling familiar tales from the bible. Cappadocia is an area of Central Anatolia best known for its rocky landscape and is honeycombed with networks of ancient underground settlements and outstanding examples of Byzantine art. Erosion shaped the incredible landscape of the Göreme Valley, but thousands of years ago humans took their cue from Mother Nature and began carving an incredible chamber and tunnel complex into the soft rock. Beginning in the 4th century, an urbanised underground cultural landscape was created here and is the focus of our visit. This morning we arrive into Istanbul. This fabled city that spans Asia and Europe deserves an extended stay so over the next two days we will see how old meets new; east meets west when you visit Istanbul’s must-see historic sites. One of the most famous monuments in both the Turkish and Islamic worlds, the Sultan Ahmet Mosque (the Blue Mosque) is a superb creation in the classical Ottoman style and features six towering minarets and 260 windows illuminating its vast main chamber, which is decorated with more than 20,000 Iznik tiles. Now a museum, Hagia Sophia was built in the 6th century by the Emperor Justinian, and was one of the largest basilicas in the Christian world. After the Ottoman conquest, it was converted to a mosque and is today one of the most magnificent museums in the world. Take a moment to linger here to admire the fine Byzantine architecture. Guests stay overnight at the five-star Jumeirah Pera Palace hotel as the train re-positions from Derince for the next stage of the journey. Late afternoon on Day 11 after the conclusion of our city tour, we leave Istanbul and travel by bus to Tetkirdag to re-board the Danube Express and continue our journey towards the Bulgaria. Engineering work in connection with the Bosphorus Tunnel project (on both sides of the Bosphorus) will involve the train stopping short of Istanbul in both directions. The journey into and out of Istanbul will be by road and the train will be sent across the Bosphorus by ferry. We arrive before breakfast in Kazanlak, situated in the Valley of the Roses, which produces rose oil prized by perfumers worldwide. Here we visit the Shipka Memorial Church and a Thracian tomb with vaulted brickwork dating back to the 4th century BC. We take lunch onboard during the climb over the Shipka Pass and travel onwards to Veliko Tarnovo, Bulgaria’s ancient capital. Nestled in a magnificent mountain setting, the stone houses seem perched, one above the other, on the steep banks of the Yantra River. A tour includes the superbly preserved medieval Tsarevets Hill and Castle and there is free time to wander through the ancient city. Relax in the Lounge Car before dinner is served as our train continues through the scenic landscape as we head across the Romanian border. Overnight the train twists and turns as it climbs over the Carpathian Mountains and threads its way through the dramatic landscape with crystal clear mountain streams. This morning we arrive into Braşov for a tour of Bran Castle. Popularly known as Dracula’s Castle, this beautiful 14th century building is situated amongst stunning mountain scenery. We return to the train for lunch as we continue onto Sighişoara for a walking tour of the town’s main highlights. A World Heritage site rumoured to be the birthplace of Dracula, it is one of the best-preserved fortified medieval towns in Europe. Burgher houses and ornate churches line its cobbled streets. Dinner is served as our train continues onto Hungary and across the Great Hungarian Plain. Our final day onboard is expected to provide a spectacular conclusion to our rail journey as first we get the opportunity to explore Kecskemét, a fascinating city at the geographical centre of Hungary before the train heads, steam-hauled, to Lajosmizse for a spectacular ‘Puszta’ horse show. We then arrive late afternoon at our final destination, Budapest, the romantic and historic Hungarian capital located on the banks of the magnificent Danube. 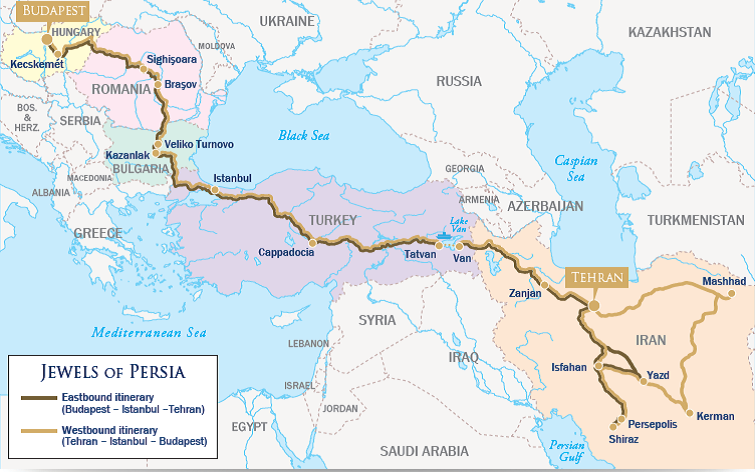 This evening we will enjoy a farewell dinner and take the opportunity to reflect on our pioneering journey from Iran to Central Europe. We will stay overnight in the Four Seasons Hotel Gresham Palace.